Are you a homebrewer interested in expanding your fermentation hobby? Well, why not jump into winemaking! Our wine kits are an excellent way to make high quality wine at home, without requiring all of the large equipment that wineries use. We have dozens to choose from, so no matter what your favorite type of wine, we're certain to have a kit you'll like! 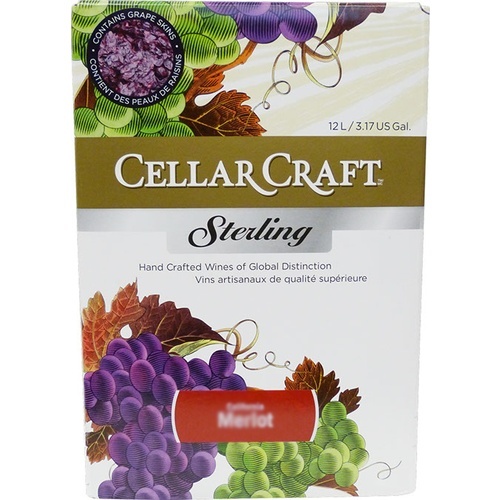 Cellar Craft's Sterling Collection red wine kits are the only budget-level red wine kits on the market that include a "virgin," never-processed crushed grape pack to include in the fermentation. Made entirely from region-specific varietal juice and concentrate, and skins from the same harvest lots that the juice comes from, these kits produce a true varietal wine on a short timeline! Designed to be bottled in 5 weeks, these kits will benefit from an additional 6-12 months of cellaring in the bottle. California Merlot with a 1.5 liter virgin crushed California Merlot grape pack. The wine releases aromas of raspberry and cherry and a subtle toasted note, followed by flavors of raspberry and strawberry. Gentle tannins and well-integrated oak contribute structure to the fruit-driven profile without being too aggressive. Should show its true character in about 6 months, but will continue to develop for at least a year. This soft red pairs with red meats and will work well with roast chicken. Have made Cellar Craft wine kits before, excellent product. I've chosen this brand before with good results. if its as good the sterling pinot noir with grape pack it will be five stars after a year of aging in the bottle. Great luck with past kit lead me to purchase this one. I just taught someone how to use these kits and he made this wine for his first one. While he did mess it up at first (nearly oxidized it), I was able to help him recover it and it finished off great. Having the skin pack was great as it definitely adds to the overall flavor and feel of the wine. These Cellar Craft kits are a great deal if you want grape skins included. The skins noticeably add to the body of the wine. I can tell I'll have to so some more serious aging too. For your first wine kit, pick up a Chardonnay. This one really starts to shine after a year of aging. Delicious.